Old Town, retains much of the ancient charm that has made this city famous. Pass through the Old Town’s gates and you get a snapshot of what the city used to look like – temples, restaurants, and small shops line the streets. For a view, head up the mountain to the Wat Phra That Doi Suthep, located approximately 4000 feet above the city. At restaurants, be sure to sample the northern Thai specialty of hang ley, a curried pork. Chiang Mai has some of Thailand’s cheapest rooms, so look in the old city center for some of the new boutique hotels built in the past few years. For a fun night out for food and shopping, head to the Night Bazaar. To get up close with nature in an eco-friendly manner, head to Elephant Nature Park for a day or even a week or two to volunteer. However, the rainy season in Chiang Mai really isn’t bad, either: though you’ll get brief interludes of rain during the day and night, you’ll be able to enjoy a quieter city and temperatures in the 70s and 80s Fahrenheit (high 20s Celsius). It’s best to avoid the hottest months of March, April and May: not only because of the sweltering heat, but because the air quality goes down significantly due to agricultural fires. Chiang Mai is the main hub in the north for tourists for a reason. It's full of great food, lovely temples, and many nearby excursions. Don't miss it! I absolutely love Chiang Mai. The city is the perfect mix of Thai culture and foreign influence with plenty of attractions, natural beauty, Buddhist spirituality, food from nearly everywhere, trendy coffee shops and cheap prices. Cool City with a part of the city in the old city walls, with the newer city build around the outside of the moat. Lots of sites, easily navigable by foot , tuk-tuk, or motorbike. Chiangmai is a wonderful city in the mountains of northern Thailand. They have a fun nightlife and plenty of other backpackers to hang with. There are also plenty of wildlife and elephant sanctuaries to check out in the area. Chiang Mai has been my favorite city to visit. I had a hard time leaving because I just fell in love with the culture and the lifestyle! Chiangmai is one of the most beautiful place in Thailand , with lots of history . Cheap city to go. Lots of activities, make sure if you go to the elephants to go to a sanctuary since they take good care of the elephants. The beaches of Thailand were gorgeous and I enjoyed Bangkok more than I expected I would, but my favorite part of Thailand (in this trip, at least) was Chiang Mai and the surrounding area. For one, the area is gorgeous. There are incredible outdoors activities for people of all fitness levels to enjoy, including those who are more inclined for sustainable and responsible travel. The elephant nature park was one of the coolest travel experiences I have had. The trekking is also quite fun and you can get in a solid ziplining experience for an affordable price. The city itself is great. There is great history and culture in the area, although I regret not exploring the wealth of local temples in the historic center of Chiang Mai. Maybe next time. The food is great as well. Try the rich local dishes, or just good Thai food in general. The prices in Chiang Mai were among the best of the trip. Chiang Mai is a big city in Northern Thailand. It's popular to travelers with its uniquely laid-back atmosphere, lots of good cafes, artsy shops, and good food. 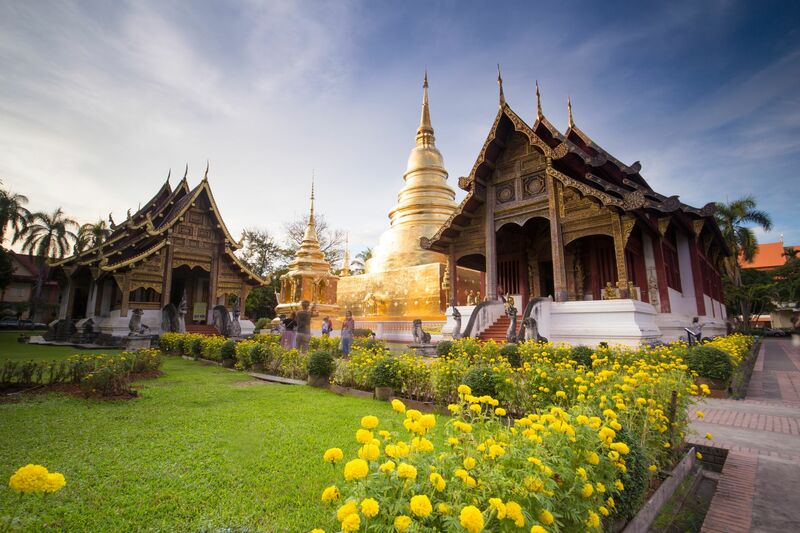 Discover Chiang Mai by foot, exploring night markets, visiting temples, and meeting people on the street. You'll meet some of the friendliest people!